This APP has been developed to provide offshore helicopter pilots with a clear overview and understanding of the 2 Obstacle Sectors that are part of the design features of most installations, platforms and vessels. As outlined in CAP437, most helidecks has a 150-degree Limited Obstacle Sector (LOS) and the 210-degree Obstacle Free Sector (OFS) and is indicated by a painted chevron on the deck. 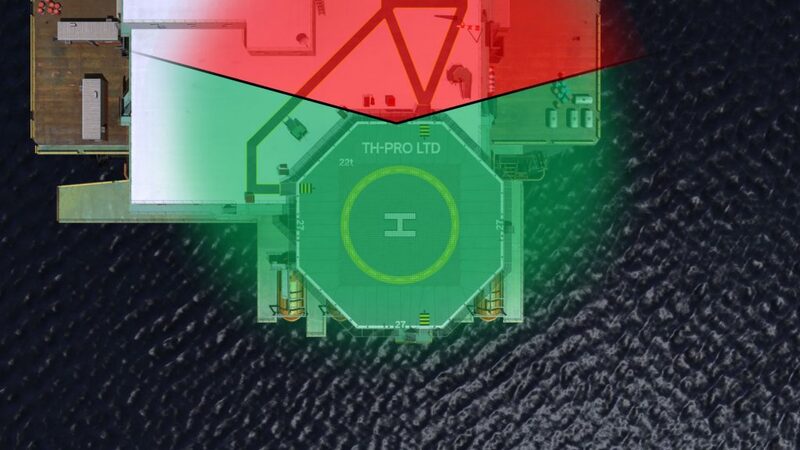 So whenever the helideck heading is changed, it will present the pilots with a different orientation of the platform and where the obstacle will be located. It is also a very useful tool to use during pre-flight planning to determine whose landing it will be offshore, but also in-flight when an Airborne Radar Approach (ARA) is required at the destination. The APP first provides the pilots with the opportunity to enter the wind direction and rig heading to align the Obstacles Sectors correctly. Once this has been entered, pilots will have a better awareness of the helicopter’s heading in relation to the obstacles and the level of risk for the approach. When pilots access the second page of the APP, the wind direction and rig heading will be superimpose on this screen and indicating the actual values that were entered on the first page. When pilots have received the obstacles (such as rigs, tankers, vessels, etc.) they can enter the distance and bearing of each obstacle and it will be plotted within a 7nm radius. This now provides the pilots with a clear picture of where all the obstructions are located around their final destination. There is a Heading Bug available on this page (with an 1nm corridor on either side of the track) to select a final inbound heading that will be clear of all obstacles. The APP is not an navigation tool, but an added tool to improve obstacle and situational awareness! All offshore helicopter pilots, helideck crews, flight dispatchers, radio operators, ship captains, aviation advisors and offshore installation managers. Add this APP to your Electronic Flight Bag (EFB) now! Created by Chilli Creative Company | © 2008-2018 Thought Process. All rights reserved.